I’ve talked about my love of CoSchedule many times before. It’s no secret that my blog would be far less organized without it. But the price has been increasing since I first signed up back in 2014. So a question I often get is… is it still worth it? Back when it was $10 per month ($5 per month if you wrote a review), it was a lot easier to justify paying for it for the editorial calendar alone. But with it now reaching $40 per month for the cheapest plan ($20 per month if you write a review), you better be exploring all of the other amazing features CoSchedule offers! That was one of my projects for my 101 in 1001 list—I’m spending a lot on my editorial calendar, so I might as well utilize everything it has to offer! And I’m so glad I looked into more features, because it has made the investment that much more worth it. If we’re honest, I’d still spend the $20 per month on CoSchedule for the editorial calendar alone. But these extra features make that pill a lot easier to swallow. Before I get to ahead of myself, let’s take a step back and talk about what CoSchedule actually is. It’s the only editorial calendar I use, and it brings in a ton of other awesome marketing tools in one place—social sharing, task tracking, email marketing, and more. Like most bloggers, I’m a one-woman team. Sure, I’ve got friends and fellow bloggers who cheer me on, but I’m the one doing all of the work. So having CoSchedule in my toolkit really helps me stay organized and make sure nothing slips through the cracks. I can drag-n-drop my blog posts when life gets crazy and I need to shift things around. And amazingly, if I change a publication date for a blog post in CoSchedule, it automatically updates the post settings in WordPress! Plus, when I send an email in MailChimp, it automatically tracks that back to my editorial calendar in CoSchedule, so I can see all of my marketing efforts in one place. So now that you have an overview of what this tool is, let’s dive into some of my favorite tools that you’re paying for but probably not using! One of the first big additions I made to my CoSchedule routine was ReQueue. It’s similar to Meet Edgar or SmarterQueue, but it lives within your editorial calendar, which in my opinion is where it belongs! Instead of scheduling social posts randomly, you schedule posts into ReQueue groups. For example, I have ReQueue groups for my blog posts, other people’s blog posts, affiliate links, tips, and questions. You might have different groups based on categories, like food, travel, and home decor. As you’re adding posts to your groups, you choose how many times you want it to be posted. Then, once it’s in the group, CoSchedule automatically fills in your social media calendar with the posts in your ReQueue groups. It’s like magic! Once a post has gone up the scheduled number of times, it’s automatically removed from the group and archived. And the best part? ReQueue is no longer an additional cost for individual plans. I used to pay extra for it, but now I don’t have to! So automate away. I have been struggling to come up with a great task management strategy since I started blogging. Notepads, various apps, some IFTTT formulas… nothing really seemed to stick. Then I started exploring tasks in CoSchedule, and I knew I was on to something. It puts your task due dates right in your calendar with your blog content and social media posts, which means you only have one place you need to check for all of your blog needs. But it’s better than that—if you have common workflows and due dates for a lot of your content, you can set up task templates so it takes a fraction of the time to get everything scheduled. Once I create a blog post in CoSchedule, I immediately go to the task sidebar on the right side (because I’m a one-woman team, it didn’t display by default, so I reached out to the CoSchedule team and they added it for me right away!). I then choose one of my task templates and get everything scheduled in about 4 seconds! I currently have 3 templates set up, based on the type of content I’m creating—a newsletter, a regular blog post, and Sunday Scratches. They all have slightly different tasks and due dates, so having them divided up has helped me immensely. I have the templates set up so a certain tasks is due X days before the post is published, another task is published Y days before the post is published, etc. Once I pull in the task template, it automatically assigns the due date based on when the blog post is going to go live. Bam! It takes no time at all. Task templates are really helping me get ahead on my content creation. One of my 101 in 1001 goals is to write my blog posts and newsletters (excluding Sunday Scratches) a week in advance for a month or longer. By sticking to the due dates I’ve assigned in the task templates, I’m slowly getting farther ahead on my content, which means more peace of mind for me! Next is saved views. Once you start loading your editorial calendar with social media posts and tasks, it gets quite crowded! To help with this, I’ve started really utilizing saved views. To set them up, open up your left sidebar by clicking on the hamburger menu at the top of your calendar. Then click on the text that says “Create new saved view.” From there, you can choose what you want to see, how many weeks you want visible, and more. I currently have 4 saved views, excluding the default “all.” Content + Tasks is my main calendar; it shows me the important stuff: what’s being published, and what I have to do to make that happen. I also have Content Only, which I’ll use when I’m adding to my editorial calendar. If I’m focusing on productivity, I’ll use Tasks Only. And finally, because I have my calendar set up to show the current week at the top (the previous week isn’t visible), I set up a Sunday View, which shows the previous week. I use this on Sundays to verify that all of my tasks for the previous week were completed. Related: Why Are Email Lists So Important to Bloggers? Finally, we have shared calendars. Once you have your saved views set up, you can share specific views with your blogging bestie or your accountabilibuddy. As your calendar updates, they’ll see the updates right along with you, no additional account or login required! 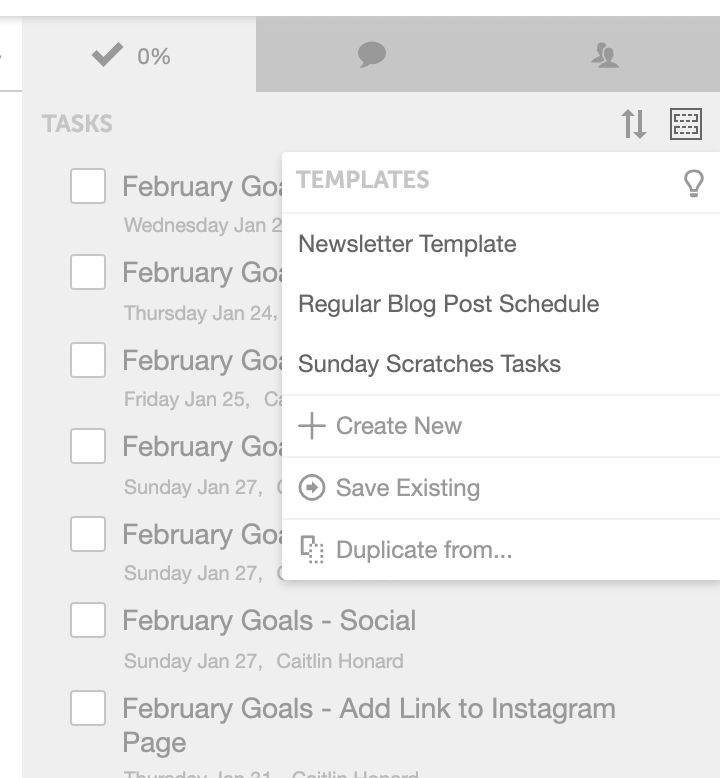 To share your calendar, go to the top of your calendar and click on the arrow that’s jumping out of a box. There you’ll see all of your saved views (and the ability to create a new view). Click on the one you want to share, and it will create a link or copy the existing link to your clipboard. Then, send your link to whomever you like! This is especially helpful as I’m working on my editorial calendar with my blog bestie Angela. She can see what I’ve already got planned in real time, because it updates for her as I add content to CoSchedule. She no longer has to wait for me to tell her over chat what posts I’ve added, how many I still need, etc. I also use this with my accounabilibuddy Elsbeth (I refer to her as the COO of my life! ), because she can see what I need to work on and what I’ve been behind on. The outer accountability works wonders for my motivation! 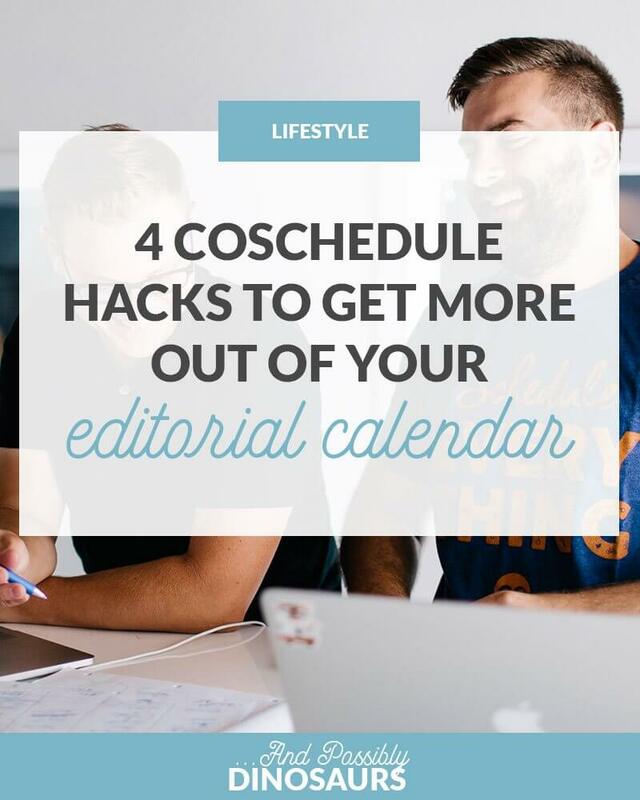 At the end of the day, CoSchedule is absolutely worth the $20-40 per month for an amazing editorial calendar. But once you add in some of the lesser-known features, it truly starts to pay for itself.